10 Jesus answered and said to him, “Are you the teacher of Israel and do not understand these things? 11 Truly, truly, I say to you, we speak of what we know and testify of what we have seen, and you do not accept our testimony. 12 If I told you earthly things and you do not believe, how will you believe if I tell you heavenly things? 13 No one has ascended into heaven, but He who descended from heaven: the Son of Man. 14 As Moses lifted up the serpent in the wilderness, even so must the Son of Man be lifted up; 15 so that whoever believes will in Him have eternal life. *One of the most beloved statements in all of Scripture about the heart of God the Father, was actually spoken out of the mouth of His Precious Son, Jesus. What a beautiful testimony of Jesus love for His Father, and their love for the world. I just never saw this before, that it was Jesus who told us that God so loved the World…So Precious and So beautiful. 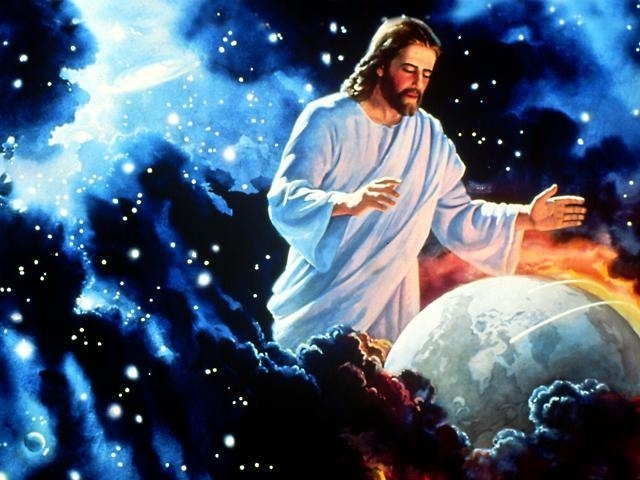 and this painting of Jesus’ with the world was so amazing too, just had to post it. This entry was posted in Musings and ponderings and tagged Jesus' testimony. Bookmark the permalink.